Antibodies, or Immunoglobulins (Ig), are the essential foundation of the immune system. They are the key to your immune system functioning optimally. They are a natural, direct and practical method of enhancing the body’s own ability to fight off bacteria or viral borne illnesses. The knowledge on IgY dates back more than 200 years. Science has long known there is something special in the common egg, other than being the perfect food. About 55 years ago, the science community discovered that the antibodies found in an egg yolk (IgY) were nearly identical to other mammals (IgG) and this could have a profound effect on dealing with certain immunological challenges. 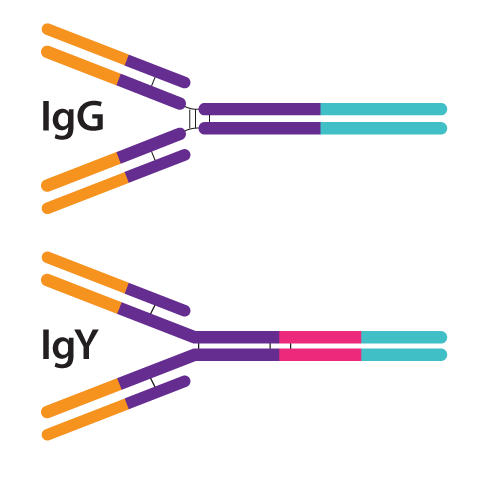 In 1970, chicken IgG was renamed to IgY when key differences were discovered making the IgY antibody unique as compared to mammalian IgG. The scientific community has since confirmed it is the ancestral model to IgG with the key difference being the size of the chain, or FC region of the molecule. Functionally, they play a similar biological role. Both IgG and IgY are the major immunoglobulins providing defense against infectious agents and appear in blood at high concentrations following synthesis of a higher molecular weight antibody (IgM). There are striking differences however: There is little or no immunological cross-reactivity between IgY and mammalian IgG. “We are the ﻿beginning ﻿of a﻿ new era of immunochemistry, namely the production of “antibody b﻿ased” molecules "
It is well-documented that immunocompetence declines with age; that is, as people age, the immune system begins to lose some of its functions and cannot respond as quickly or as efficiently to stimuli. 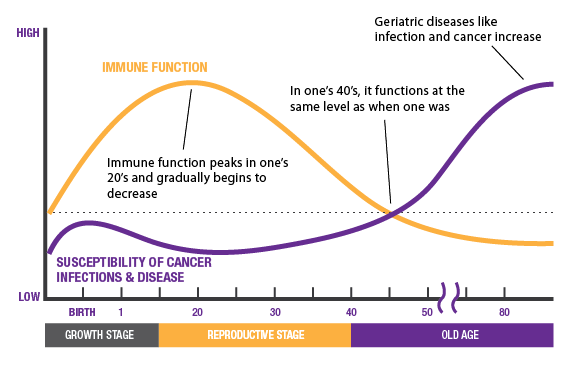 Age-related changes in the immune system have been observed at all levels ranging from chemical changes within the cells, to differences in the kinds of proteins found on the cell surface, and even to alterations in entire organs. Studied separately, some of these changes may seem trivial, but when all of the changes are added up, they radically affect the overall health of the individual. Under normal conditions inflammation plays an important role in defending the body against pathogens such as viruses, bacteria, fungi, and other parasites. However, the many different stressors from daily life, including physical imbalances, diet, allergies, sleep deprivation, excess weight and age can create an imbalance to your immune system and increase body inflammation. Uncontrolled inflammation, also known as an "Inflammation Cascade", can open up the body for diseases and other ailments. Interleukin-8 secretion is increased by oxidant stress, which thereby cause the recruitment of inflammatory cells and induces a further increase in oxidant stress mediators, making it a key parameter in localized inflammation.In the pilot study, all participants showed a dramatic decrease in the IL-8 marker. IL-8 is is an important mediator of the immune reaction in the innate immune system response. Interleukin-8 is often associated with acute inflammation has been cited as a pro-inflammatory mediator for a certain autoimmune-related issues. Key factor in this study were NO outliers existed in the group. Granulocyte-macrophage CSF plays a role in the growth, development, and maturation of granulocytes, macrophages, and dendritic cells . GM-CSF has been implicated in allergic inflammation in human and animal studies. 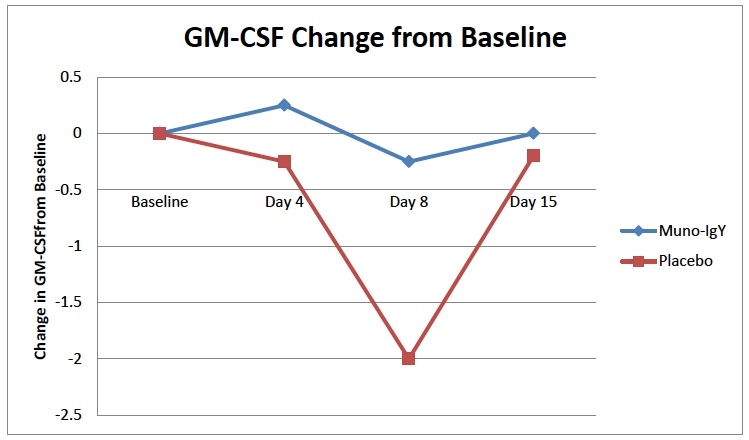 GM-CSF deficiency impairs the inflammatory response in this model. Several key features of allergic inflammation are reduced GM-CSF. 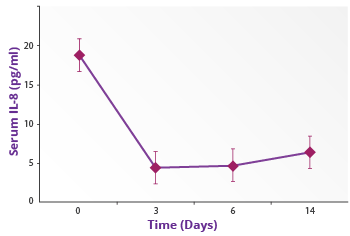 In our study, the group taking Muno-IGY maintained a static level of GM-CSF, while those on placebo had lower levels. All subjects were assumed to be in contact with the same allergens present in North Texas in the fall season. While not definitive on it's own, this supports our clients claims of improved resistance to seasonal issues. There are over 800 studies published. The vast majority have used specific lab created IgY for experiments. IGY Immune Technologies and Life Sciences is committed to adding to the growing body of science on IgY. The science of IgY has been focused in 2 areas. Specific IgY for diseases and pathogens, for use in humans and domestic animals, plus general low purity IgY used in health supplements. To learn more about us and our work, please visit igylifesciences.com.